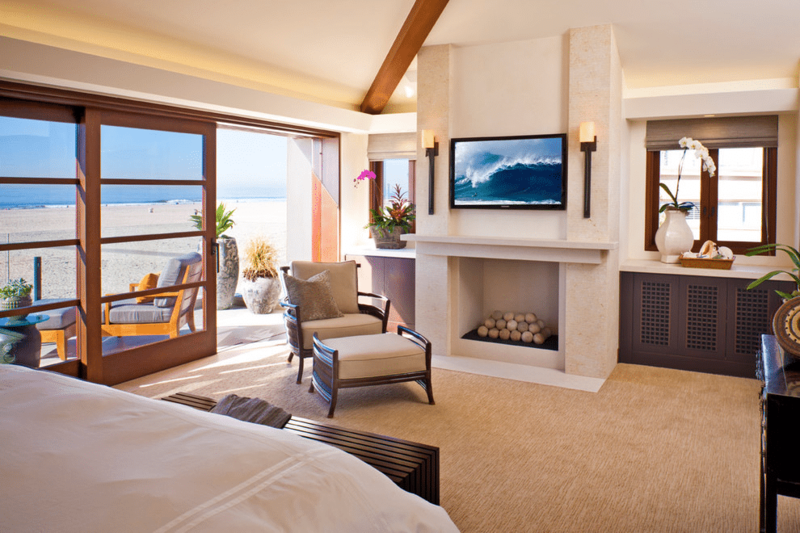 With eight miles of beach, 277 days of sunshine and a temperature range of 50-80, Newport Beach, CA, is the perfect place to enjoy a home that invites the natural environment into the living space. The Balinese culture is rooted in a harmonious relationship with nature, and this home unites indoor and outdoor spaces with an arresting alliance of architecture and interior design. Throughout the home, there is an airy and earthy ambiance reminiscent of Bali along with the clean lines of modern design and areas of minimalism. The most prominent message that we get, however, is that the owners want their home to be comfortable and welcoming. 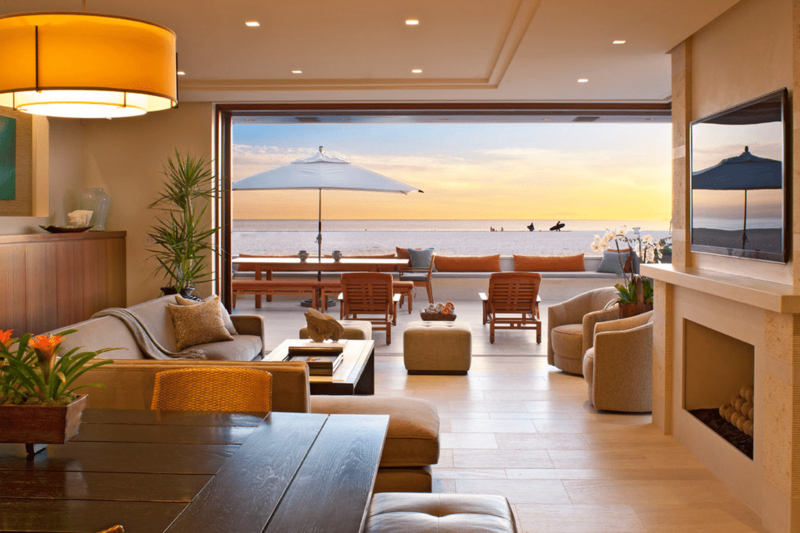 The living room perfectly illustrates the seamless integration of outdoors and indoors. From this perspective, there is an optical illusion of sorts: Where does one stop and other begin? The living room wall is completely open (the span of mahogany doors ingeniously tucked away into the wall), and the raked limestone flooring continues out onto the patio. Looking in from the outside, we see the open floor plan with just a hint of division obtained with narrow walls. The painting on the right, recessed into the wall and softly lit, counterbalances the flat screen TV on the left wall. A surprising element in this room is an upholstered ottoman used as a coffee table—clever idea. Here we have a close-up look at one of the dividing walls. The alternating bands of raked limestone and smooth limestone are perfect with the flooring while warding off any chance of monotony. The woven fabric on the dining chairs keeps with the natural theme, and the subtle peach of the chairs and double shade pendant lamps add a soft colorful glow to the room. Double shade pendant lamps are used throughout the home and provide a harmonious consistency. The carpet in the master bedroom could easily be mistaken for one made from natural hand-spun yarns: the linear pattern, the texture, the variations in color. It is, however, 100% nylon and finished to resist soil and stains. The gas fireplace has “cannonball” rocks which add a natural decorative element as they are and, of course, when they are aflame. The drop-in soaking tub, made of acrylic for warmth and comfort, is set off with a turquoise, recycled-glass deck. The ethereal tone of the bathroom is achieved with the use of a Shoji screen for privacy (rather than the harshness of a wall) and the hard-fiber rice paper panels that allow in a diffused light. This is a patio—believe it or not. The correct term is “loggia,” since it is open only on two sides. Another extraordinary example of blurring the line between indoor and outdoor space. 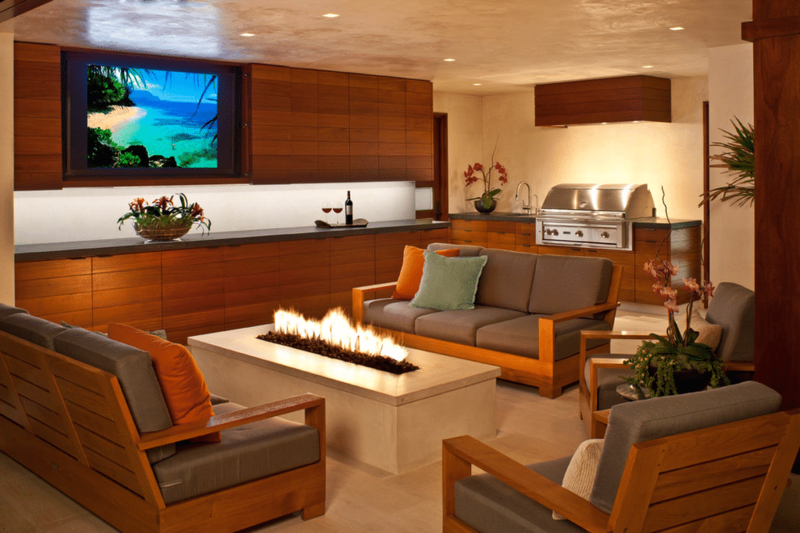 The accouterments of a patio are there: the glass fiber-concrete fire pit, the built-in grill (with sink and counter space! ), and the teak furniture. The spa is right above the loggia. Here we see again the raked limestone flooring and the teak patio furniture. And the centerpiece—a spa infinity pool. If you look back at the exterior of the home, you’ll see how area this sits up on the second story, giving those luxuriating in the pool privacy while they still can still survey the grandness of nature surrounding them. The owners achieved what they had planned: a home that ebbs and flows as though in tune with its natural surroundings. And one that is both elegant and comfortable. There are no tacit “Keep Off” signs. The home is to be enjoyed. 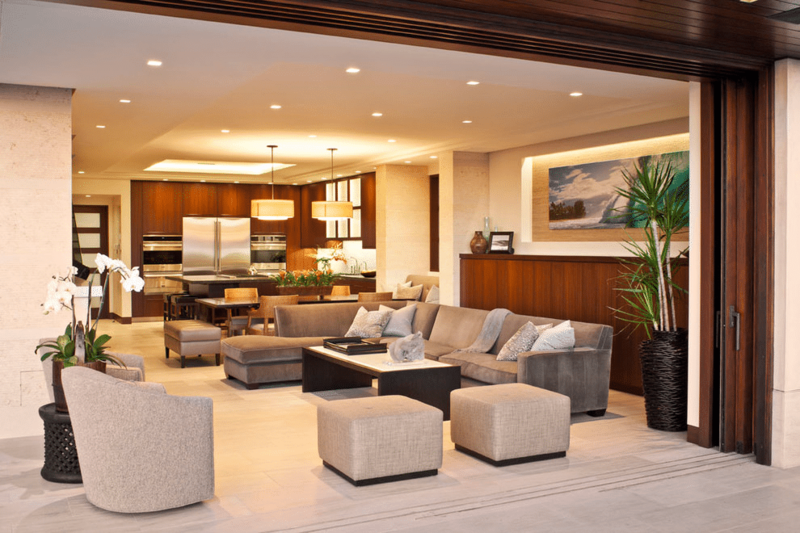 Its furnishings call to the residents and their guests to kick back and commune with nature and each other.